TWO GREAT DC GREEN BOOKS - ORDER NOW!! Click 'Read More' to check out the covers and latest reviews! STINKY SQUAD is about a country called Oztrailer where everyone turns into brain-eating zombies. The nation's only hope is a bunch of loser teens with gross super-powers... Stinky Squad! 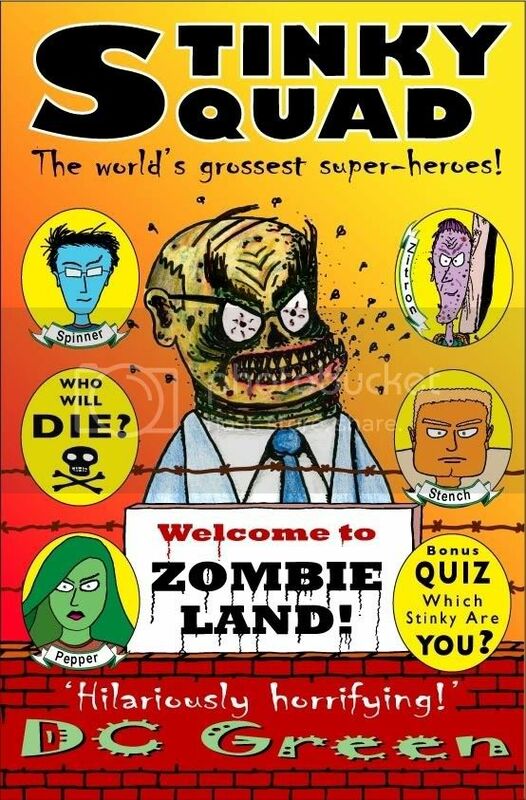 Stinky Squad is gross, funny, scary and ultra-fast paced: perfect for readers with strong stomachs aged between 10 and 110. ‘Fantastic… a very exiting read for kids and a very, very funny book.’ – HG Nelson. - Sally Odgers, children’s author. - Jensen Ruehle, Bookmark Australia. - Carol Roach, Storytime Tapestry. - Jodi Flessberg Lily, Creative Writers Network moderator. - Sandy Fussell, children’s author. - Maria Stepek Doherty, Storytime Tapestry Senior Writer. I performed an early version of this story at many of the 100+ schools I visited in 2006. The reaction to the three naughty pigs was so fantastic, it was obvious they were destined to score their own book. And now they have: a brilliant picture book chocked with laughs, surfing action, surprises and amazing artwork by the mega-talented Simon McLean. Three Little Surfer Pigs is the perfect book for all the family, covering ages 4 to 154, and above average pets. 10 % OF ALL SALES GO TO CANTEEN - the Australian organisation supporting young people living with cancer! – Sally Odgers, Jack Russell, Dog Detective. - Jackie Hosking, PIO reviewer. - Pam Burridge, Australia’s first women’s world surfing champion. Youb read some Stinky Squad at my school in Dubbo and i cant wait til it comes out. It was funny and exiting and sounds like the best book ever!! You came to Mulyan PS in Cowra. My friends and I laughed so hard I cried. Stinky Squad is the most exciting book in the whole wide world! I read it all in two nights and didnt even stop for TV! Mmm... TV! I've had two great weeks of touring the Central West now. I'll be back again in 2008! Stoked you liked Stinky Squad!! I have to say that I love this article. This blog has been so simple and has a lot more features than other blog articles. The layout and design is great. I will continue to come back here for every articles! Thanks a bunch. Cool blog...... .
i cant wait till this book comes out it seems really cool and funny!!! Right now I'm in the middle of a week of touring Canberra schools. Then I've got four more touring weeks on the road. I'm really enjoying myself, and best of all, my voice and old car are both still going strong! My name is James. I have written to you because I love your books. When you read this I will be reading Stinky Squad. Here are some questions, if you have the time would you please answer them? Do you write adult books? I love Spinner and Stench. I saw you at my school and at Corrimal library and you were hilarious both times. Keep up the good writing. Looking forward to more books. * I used to write adult books, but now I just write books for kids (but adults are allowed to read them too!). * I've been learning how to surf for over 30 years! * Your mum is right (mum's usually are!). I've had a lot of enjoyment from the Harry books too. when is your new eramus james book coming out?becuase i`m nearly finished eramus james and the galactic zapp machine,plese reply. The next Erasmus book - Erasmus James, King of Kid's Paradise - will be published this August (2008) by Barrel Books. It's funnier and more exciting than the first book! I THINK YOUR BOOKS ARE COOL BUT CAN YOU MAKE SOME NON GROSS ONES FOR GIRLS? THANKS FOR COMING TO OUR SCHOOL TODAY YOU HAVE INSPIRED ME TO WRITE AND FOLLOW MY DREAMS. YOU ARE A FANTASTIC WRITER. I BELIVE YOU COULD BE A FAMOUS CHILDRENS WRITER AND YOUR BOOKS COULD WIN A LOT OF AWARDS. I THINK ALL YOUR BOOKS ARE AWESOME BUT CAN YOU WRITE A BOOK FOR GIRLS AND NOT SO GROSS. IF YOU KEEP ON WRITING BOOKS, I THINK YOU WILL HAVE A GREAT CAREER. IF YOU KEEP UP THE GOOD WORK, YOU'LL MAYBE EVEN BECOME FAMOUS!HAVING YOU COMING TO THE SCHOOL TODAY, HAS MADE ME REALISE HOW MUCH BETTER I CAN MAKE MY WRITING. YOU HAVE ALSO TAUGHT ME TO FOLLOW MY DREAMS AND KEEP TRYING. JAZ- ST B'S THE BASIN. I actually wrote Erasmus James as a book for girls! And Erasmus was a girl main character named Jessica until my first publisher made me change her to a him! And, yes, it would nice to be famous one day... but if not, I still love my job! Thanks! I had fun at Parkwood PS too! tanx for coming to Mudgeeraba State School DC Green. Wow, I'm honoured to be your favourite author! Thankfully, Mudgeeraba SS has my books and you can always order signed copies through the school (but hurry!) or hassle Robina Library to order some! Thanks for the cyber-flowers, Sarah! I hope you get your lungs back inside where they belong! DC Green's Top Ten FAQs!